As my experience accumulates, I am tempted to try more ambitions hikes. I guess this is what attracts me to winter hiking. 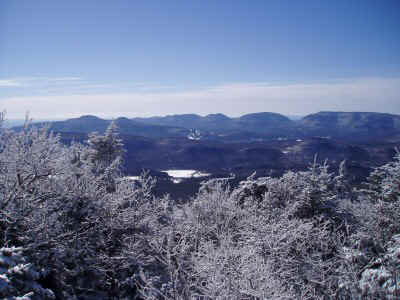 Last winter I learned to use crampons and snowshoes, and I climbed my first trailless peaks in the snow. So it was time for me to spend a night camping in the winter. 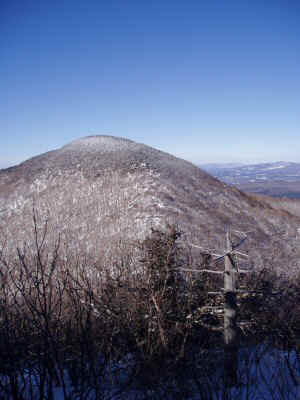 I picked Blackhead Mountain because I had been up it recently, and because it was a required winter peak. also, there is a lean-to only a mile in from the trailhead. I thought it might be an easier introduction to winter camping than staying in a tent n the snow. Although the weather had been relatively mild all week, the temperatures dropped for the weekend, with a predicted high of 25 and a low of 0. I was fortunate to get away from home by early afternoon, meaning I arrived at the trailhead an hour before dark. I passed by a few people coming down the trail. By the time I saw the last party, I figured the parking area was empty, save my car. There was less than a foot of hard snow on the ground, the moon was almost full, and even after dark it was pleasant to walk in the moonlight. When I reached the lean-to, I saw that I would have it all to myself. I was warm enough when I was climbing, but as soon as I stopped, I realized how cold it was. All my water was beginning to freeze, my lighter was apparently frozen as well, and my hands would go numb in a couple minutes without gloves. I managed to get the stove going really quickly, thankfully. As it was heating my dinner, I set up for the night in the back of the lean-to. 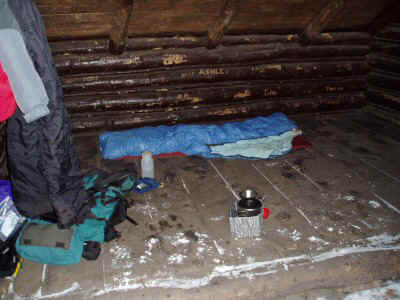 I gobbled down a hot dinner and a cup of soup, put all my water bottles and bags in the sleeping bag, and crawled in. I can't say I was toasty warm, and I had to get up from time to time to put on or take off layers of clothing, but I did manage to sleep most of the night. It started to snow lightly around midnight, then the wind picked up and started howling, but I was pretty well protected in the back of the lean-to, so I just hunkered down and tried to keep warm. By dawn I was still hanging in there. It is easy to forget how the cold makes every little thing so much harder -- starting the stove, packing the sleeping bag and pad, pouring water. Each thing requires fumbling with gloves, freezing hands, moving around with bulky clothing. I quickly consumed my hot chocolate and oatmeal, poured hot water into each of the water bottles, and finished packing up. 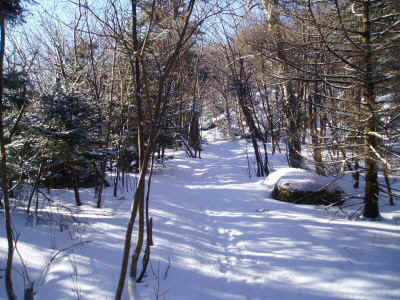 I headed up the Blackhead north face trail. Tthe memories of its incredibly steep middle section were fresh in my mind. I just figured I would deal with each section as I reached it. The previous day there were clear footsteps in the snow, but the fresh snowfall had covered all that, so I had to pay close attention to the trail markers. On this trail, unlike many others, the approach to the peak is sudden and unexpected -- there are no nearby peaks in sight to measure progress against, nor distinct cliff bands just below the summit. So I was surprised when the trail leveled off, and I was suddenly at the top. It took only 90 minutes !. Next I headed down toward the saddle. Out in the open, going downhill, I began to feel cold. The views, however were spectacular. I stopped to observe the thin band of evergreens on the very top of Black Dome. Wyndham High Peak had no such patch of green on top. 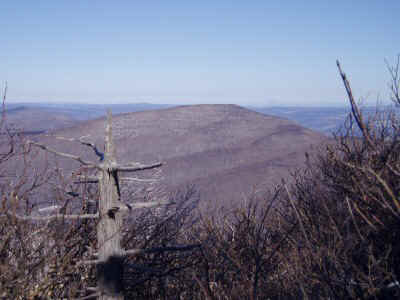 As I headed back up Black Dome I warmed up again, shedding layers. It was not long before I was on top. I found the overlook and sat down to have a snack. My experiment with insulating the hydration tube was a failure -- it froze up within minutes. I had quite a struggle getting the cap off the bag so that I could take a drink out of the filler hole. On top of that, I found all my snacks were frozen solid. I did not realize how hard it would be to eat a power bar that was frozen. A bit refreshed, I headed back down. I came across another hiker, the first that day. As I headed back down, I encountered more and more people heading up. 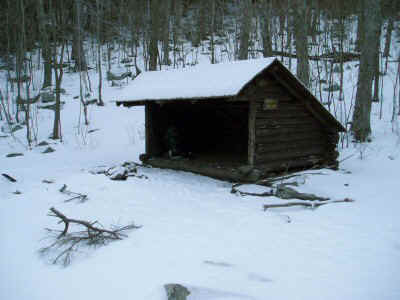 When I got back to the junction and headed back to the lean-to to retrieve my pack, I was again on untrodden snow. Apparently no one else wanted to challenge the north face trail. I made it back to the car by 1:00, just right to make it home by dinner time. It is now three days later, and still my hands and ears feel hot all the time.